If you are running out of hard disk space, what you probably do is to find out the largest files which have consumed most of the hard disk space or identify duplicates files so that you can perform some clean up to free up some spaces. Previously we did mention Check Your Disk! that is able to identify which folder or file has consumed most of the space, now there is another tool, named as Primitive Duplicate Finder which can help you to identify duplicate files easily by scanning through the selected folder. 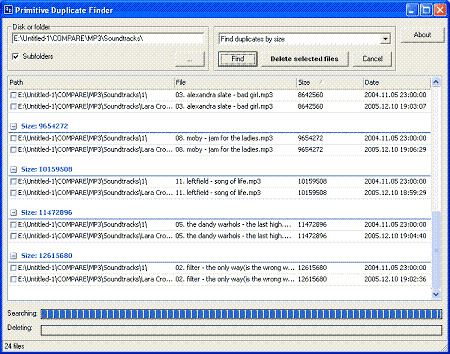 Primitive Duplicate Finder is a tiny and easy to use software tool. What you need to do is just select a folder that you want it to be scanned through, then select the search criteria such as find duplicates by filename, find duplicates by size, find duplicates by filename and size or find duplicates by content. It will scan through the folder and its subfolders based on the predefined criteria that you have selected and list down the duplicate files if there is any. If you have identified the duplicate files and confirmed that there are no longer needed, you can select those unwanted duplicate files and delete them directly from this tool. Primitive Duplicate Finder version 1.1.0 is absolutely free to download and is compatible to run on Windows 2000/XP/2003/Vista. It doesn’t requires any installation, just run the executable file to launch the application either from local drive or from USB device.